Monitoring the performance of a road on peat, and the peat below it, provides some very useful information on the stability of the road in the short and medium term. In the short term: monitoring of settlement below the embankment during the construction period will give an indication of the rate of ‘primary consolidation’ in the peat and help manage the excess pore water pressures in the peat. This is key to ensuring that the pore water pressures are given sufficient time to dissipate, and the peat gains sufficient strength to support the next layer. This is particularly useful when using stage construction, or a temporary surcharge, where each layer in the sequence has to rely on the strength of the underlying material. Rises in ground water levels. All of the monitoring data should be collected, plotted, reviewed and evaluated by competent personnel. Good systems of site monitoring will be able to identify any departures from the design plan and allow appropriate actions to be taken in time to be effective. Monitoring of the works during the construction phase can also be useful in optimising the loading rate of materials, i.e. the delivery times for materials at the head of the embankment as it is being constructed. In the medium term: continuing monitoring of he site after completion of construction is highly useful in identifying and predicting the post-construction ‘secondary compression’ settlement over the design life of the road. If this rate is considered unacceptable, for example due to the class of road or the closeness of adjacent structures, measures can be taken to reduce the rate to a more acceptable level, eg a longer period of construction, the use of temporary surcharge, etc. Three main types of monitoring equipment are used across the Northern Periphery; settlement gauges, lateral movement inclinometers and porewater pressure piezometers. The frequency of monitoring will be dependant on the specific circumstances at each particular site and the stage of construction of the works, but an average of 2 times per week is not uncommon to monitor settlement and the rate of construction. surface settlement plate is a simple visual measuring device and normally consists of a flat plate (usually 500mm x 500mm) on to which is welded a rod of sufficient length to ensure that the end extends above the surface once the settlement has taken place. The plate is positioned on the surface to be monitored, such as a construction layer, a geotextile layer or an original ground surface and as an added sophistication its rod can be sheathed in a duct to protect it during settlement of the overlying fill. These plates are then referenced back to fixed ground control points for consistency of monitoring. A depth settlement plate is normally used where it is necessary to know the behaviour of a point in the soil below the settling embankment. To achieve this the settlement plate is fabricated as a short length of screw and screwed down into the soil to the depth required. Once in place the screw is effectively locked in place within the soil mass and moves as the mass settles giving an indication of the settlement at the initial installed point. As with surface settlement plates depth plates are referenced back to fixed ground control points for consistency of monitoring. The hydrostatic profile gauge (or ‘hose settlement gauge’) developed by the Swedish Geotechnical Institute is a popular device for monitoring the cross-sectional profile of settlement under embankments over peat. 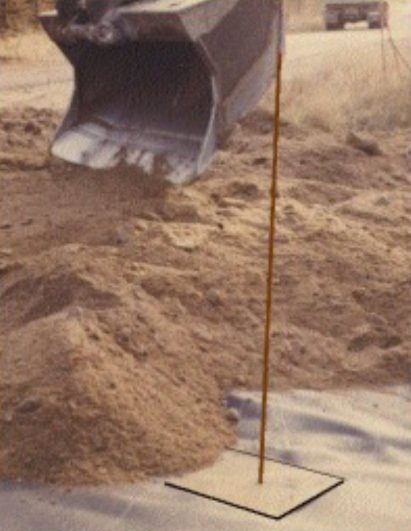 For a normal installation, a 50mm diameter plastic tube is placed on the peat surface transverse to the road line prior to commencement of filling operations. As the layers of fill are placed on the peat, and the embankment settles, a pressure transducer is pulled through the tube to measure its deflected shape under the embankment. 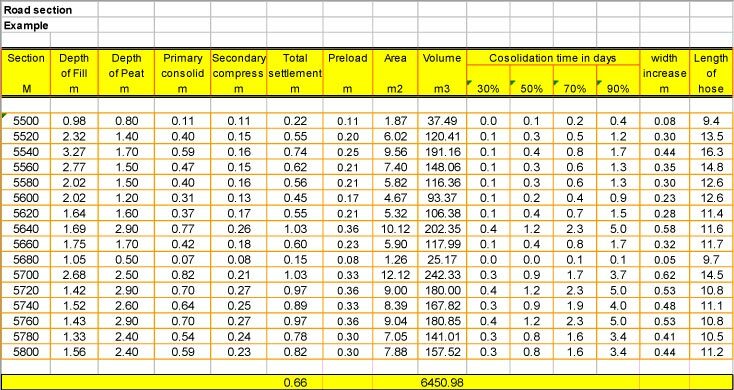 The measurements obtained are then reduced to the contract level datum and presented as a cross section through the embankment for use in measurement and earthworks control purposes. Once the actual settlements for each cross section are known they can be compared with the geotechnical engineer’s predictions of settlement. If necessary, these predictions can be recalculated to accord with the actual measured settlements by “back calculating” the theoretical peat parameters that would give rise to the measured settlements. These parameters can then be used to predict the future behaviour of the loaded peat. Vertical settlement of embankments constructed over peat is almost invariably accompanied by some lateral movement within the peat mass away from the loaded area. This lateral displacement can result in increases in the vertical settlement of the embankment by up to 15% depending on the type and depth of the peat deposit so it is only sensible to try to measure this as it happens. Generally this is done by monitoring the lateral displacements on site and ‘back calculating’ the observed results to better estimate the aggregated effect. There are a number of methods available that can help measure the amount of lateral displacement and a summary of the more popular methods used in the Northern Periphery partner areas are given as examples below. Surface measurement of lateral displacement is normally done with monitoring pegs that are referenced back to a fixed datum before the commencement of operations and monitored regularly afterwards to the same datum. This can be at its simplest by means of a series of pegs driven into the peat surface along a line of sight where the pegs will be seen to deviate during loading operations. The ‘out of line’ deviation can also be measured by physical survey to a digital base. The benefit of a rigorous engineering survey is that it can produce an accurate record of proceedings, that can be relied upon in the case of dispute, and also allow analyses of horizontal movements and any associated surface heave. The measurement of lateral displacement within the peat mass at depth is normally carried out using inclinometers and there are many types of devices on the market (see “Field Instrumentation in Geotechnical Engineering” by TH Hanna 1985 for a good range). Inclinometers are normally installed at the toe of the embankment sideslopes but can also be usefully installed at other locations to monitor construction effects. Inclinometer readings can be particularly useful in the early identification of excessive lateral movements and give warning of developing instability. Within the Northern Periphery the most popular instrument is the inclinometer developed by the Swedish Geotechnical Society. 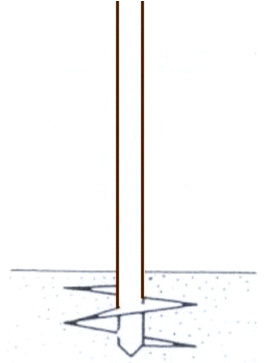 This method installs a 42mm diameter flexible plastic pipe down through the peat mass at the survey point and the inclination of the pipe is thereafter measured at regular depths (normally at 1 to 2m intervals depending on the overall depth of the peat deposit) by lowering down an inclination sensor. 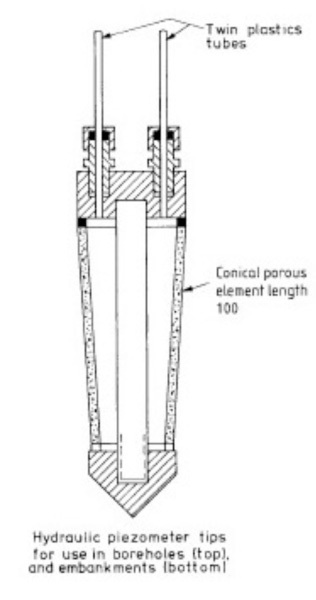 The pipe is provided with a telescopic tip to avoid the influence of the settling soil mass on the inclinometer as the embankment load is applied. In this method the sensor measures the instantaneous inclination of the pipe at the point being measured and using this a deflected shape down through the peat mass can be obtained by graphically or electronically summing these successive instantaneous measurements. Porewater pressure is normally monitored using piezometers installed within the peat mass. A number of piezometers are currently available on the geotechnical market, from the simple standpipe piezometer through hydraulic, electrical and pneumatic varieties to the more complex vibrating wire unit. All can give satisfactory performance but not all give the same response time and this may be critical in giving warning of a soil failure.